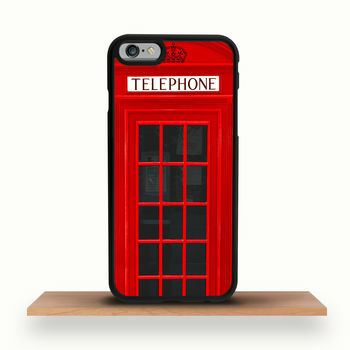 iPhone case re-imagined as the British telephone box. Made to fit iPhone X/XS, iPhone 8/8 Plus, iPhone 7/7 Plus, iPhone 6/6S, iPhone 6 Plus/6S Plus. iPhone case re-imagined as the iconic British red phone box - the design that has stood the test of time. Put your iPhone inside the phone box! This Telephone Box Case for all iPhone models is hand-made and gives a great protection for your iPhone and its iconic design will make your phone stand out from the crowd. Made to fit all current iPhone models (select the correct option on the right when ordering) and is available in black or white colour frame to match the colour of your iPhone. The white option looks great on the phones where the front glass is white. Available for all current iPhone models. Can be ordered in black or white to match your iPhone's front glass colour. Fits: iPhone 5/5S, iPhone 6/6S, iPhone 6 Plus, iPhone 7, iPhone 7 Plus, iPhone 8, iPhone 8 Plus, iPhone X/XS, iPhone XR, iPhone XS Max. Vary depending on the iPhone model.